By working together and recognizing the collaborative’s collective assets, UACC offers insight into how community-led development efforts can reverse entrenched patterns and provide hope. The best board chairs understand that the point is to help the system find its way into the future, but this is a path that requires listening, sensing, and a deep, abiding curiosity. 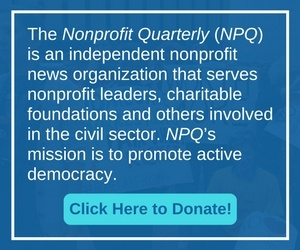 As NPQ has widely covered, stated nonprofit support for diversity is often not reflected in their leadership. Former nonprofit CEO Kenneth Taylor highlights some of the challenges while identifying a few action steps that nonprofits pursuing board and leadership diversity can take. In this webinar, Anne Wallestad and Vernetta Walker of BoardSource delve into the findings from Leading with Intent and share tips for developing a strong board culture.